Immigration invigorates and enhances a nation's cultural identity and also its economic activity. Without immigration Britain would become static and cease to develop, we would just wither away and become irrelevant. 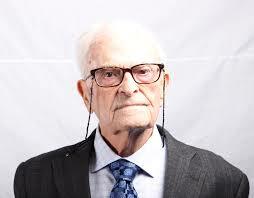 Harry Leslie Smith is a survivor of the Great Depression, a second world war RAF veteran and an activist for the poor and for the preservation of social democracy. His latest book ‘Harry’s Last Stand’ provides a unique perspective on NHS cutbacks, benefits policy, political corruption, food poverty, the cost of education – and much more. Show Racism the Red Card spoke to Harry after he agreed to join 'Writers Against Racism' to get his take on racism, immigration, multiculturalism and the ways in which he believes Britain has changed. You mention in your book that immigrants have always been scapegoats for issues like crime, stealing jobs, etc. Can you tell us about your experiences of this? Why do you think people are so keen to blame migrants? "When I was a young lad (c. 1933) my family moved to Bradford from Barnsley because there was no work to be found for my dad and so many others in the town of my birth. So we upped sticks and departed for a larger city in hopes that my father might be able to find some gainful employment. Bradford back then was a cauldron of migrants from other parts of Yorkshire and Ireland. As newcomers we were considered by some who were born and bred in that city to be outsiders, who were taking food off the table of local residents by competing for scarce jobs or eating local resources by accessing the meagre dole. Back then my family and other newcomers to that region weren't the cause of our country's economic misfortunes, nor are modern immigrants to Britain today. The real issue is a system that is skewed to favour those at the top rather than the rest of us that hover on the lower and middle rungs of society. Unfortunately in desperate times when people feel that their livelihood is threatened by economic forces beyond their control they panic and are susceptible to not thinking issues through. Instead, many settle for clichés to explain to them why they didn't get the raise at work or why they were made redundant. Governments and business would prefer us to blame the migrant rather than inadequate labour laws, skewed tax regulations that encourage corporations to pay only subsistence wages and forgo yearly wage increases. And unfortunately too many people in this country revert to a factory default setting where they blame every calamity to befall us on immigrants. It doesn't help that politicians like to deflect voter disenchantment by using new migrants as scapegoats. Enoch Powell did that in late 1950s and 60s while today both the Tory and Labour party also like to point the finger at immigrants rather than their disastrous economic policies. The media also has its finger stuck in the anti-immigration pie. All one has to do is see how the tabloids at the start of year as well as established television news companies fanned the flames of ignorance over legal migrants from Eastern Europe." In the book you also discuss racism by a family member referring to 'Bradford being full of Pakis'. Can you give us your own views on how you would challenge this form of racism? "This is the most difficult type of racism to eradicate because it is bred in an atmosphere of both economic and societal hopelessness. Its root cause is when governments abandon entire regions and let them turn into rust belts where able bodied people are denied the right to work because industry has packed up and left for greener pastures of profits. The only way of tackling this form of racism is to go to its source which is systemic poverty, poor education, lack of employment opportunities otherwise this form of racism will become worse." Do you think that immigration has been beneficial to the UK? "Most certainly, immigration invigorates and enhances a nation's cultural identity and also its economic activity. People forget that UK is a united kingdom of diverse regions which were joined together to form a unified country that thrived and evolved for the better because of its differences. Immigration makes us a better and more competitive country because the nation like human beings must adapt and modify itself to survive and evolve. Without immigration Britain would become static and cease to develop, we would just wither away and become irrelevant." Can you tell us about your positive experiences of learning from other cultures, nationalities and religions? "I would not have become the man I am today without my rubbing shoulders with other cultures, nationalities and religions. I feel very fortunate to have been able to interact and become friends with so many people from different backgrounds. Yet the most positive and influential experience for me when it comes to encountering a different culture would be when I was stationed with the occupying forces in Hamburg in 1945. It was there I met and became involved with Friede. She was German and at the time because of the war and the suffering it caused there was much confusion and distrust between Brits and German civilians. She, however, taught me that life is about nuance, about trying to put yourself into the shoes of other human beings and understanding that each human being is unique and must be treated with respect and compassion. Friede showed exceptional courage when she agreed to marry me and immigrate to Britain. It was at first a hard transition for her and there were some instances of prejudices against her from both my family and strangers. Fortunately, the post-war era was a time of great optimism and most people just wanted to get on with their lives after the suffering they had endured during the Second World War. During that era I lived in Halifax and I marvelled at how it embraced new migrants from eastern and southern Europe along with Southeast Asia. For me having friends from Poland, Italy and India opened up my eyes to new customs and ways of looking at the world. Yet all of us, no matter where we hailed from were chuffed and proud to live in Britain and play a small part in transforming our country for the better. In later life I felt very fortunate to have worked in the carpet trade where I was exposed to a multiplicity of cultures that all worked in harmony together. It was a wonderful experience to be exposed to the cultures of Asia and the Middle East in an atmosphere of understanding and respect for the point of view of others." What are your views on UKIP? "UKIP concerns me because on the surface they seem as harmless as a summer church fete. However, if you scratch beneath the surface you find a malevolence there that if allowed to govern will erode fair play. UKIP's popularity amongst lower and middle income earners is a direct result of the 2008 crash. Ordinary people are worried that they are losing their financial foothold and concerned that their children might not get a chance at having a happy life because our nation along with the western world is entrapped by economic austerity policies that punish 90% of the population but leave the well off unscathed. Unfortunately UKIP appeals to people's baser instincts or our fear that we are going to get the short end of the stick. They use wedge politics and polite demagoguery to attract voters to their simplistic politics that blames the marginalised and immigrants as the source of all our economic woes. Yet I don't think the people who join or support UKIP are intentionally cruel or unfeeling towards immigrants. I believe they are just so tired of trying to maintain their standard of living that they are willing to surrender common sense to any politician that offers them the easiest of answers to our woes which is a convenient scapegoat to blame along with a pain free solution to our problems." Do you think as a society we have made any progress in fighting racism in the last 30 years? "In many ways Britain has become a more inclusive society to that of my younger years. We have as a nation come to realise that our strength can come from our diversity. When I look at my grand kids and their friends I see young men and woman who embrace new cultures and customs without fear of losing their own identity. It is gratifying to know that the young don't have the prejudices that were present in my younger years. However, what is disturbing is that today's youth still accept poverty and economic segregation as normal." Any other points you would like to make with regards to combating racism or the issue of racism in society? "I believe the best way to combat racism is to fight poverty and economic inequality. Like all pestilence racism is bred in unhealthy environments. Poverty and the fear of poverty create climates of distrust and ignorance. But what really has to happen to put an end to racism is people have to stop believing that their way of life or belief is more entitled to respect than someone else's. As long as we accept that each person regardless of their race creed or sexuality is deserving of respect and understanding, we might be able to eradicate racism like it were polio. As long as we demand that all people have a right to live in peace and freedom, racism and prejudice can become extinct. Some might read this and think I am idealist, but I am not I am a realist. You have to remember that when I was born in 1923, prejudice was rampant and as foetid as an open sewer, it all changed because the people demanded equality. Today, we can do it again but we have to get off our backsides and work for it because nobody is going to hand it to us. Racism unlike many other problems in the world begins and ends with each of us."